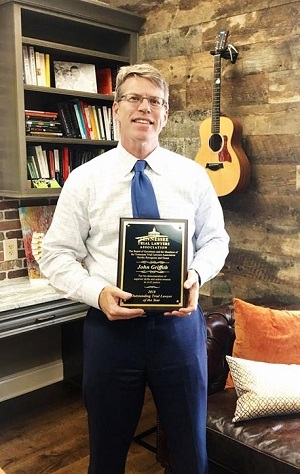 On June 20, the Tennessee Trial Lawyers Association (TTLA) named our founding attorney John Griffith the Outstanding Tennessee Trial Lawyer of the Year for 2018. The award is given annually to lawyers in the state who have demonstrated superior skills and achievements in civil justice. 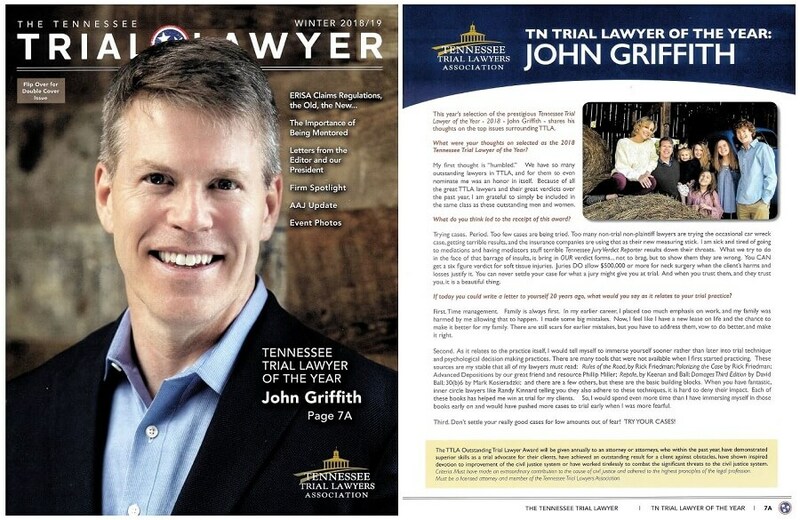 As a founding member of GriffithLaw, John Griffith has been helping injury victims throughout Tennessee who have suffered traffic accidents, slips and falls, and wrongful death for over 20 years. From the firm’s office in Franklin, Tennessee, John and his staff work diligently on behalf of premises liability and personal injury clients. John created GriffithLaw as an alternative to personal injury firms that are focused on numbers instead of serving their clients. The firm’s motto, Our Family Protecting Yours, represents the firm’s core mission of shielding clients from further injury as they assert their claims. Clients are not expected to pay for court costs or legal fees until after their case is won, allowing them to focus on their recoveries while John fights for their best interests. As a result of this personal and dedicated attention, many clients become like family. John has received numerous honors and accolades throughout his career, including selection as Memphis Business Journal’s “Best of the Bar” in 2013 and 2014. This designation is given to the top legal professionals in the Mid-South based on their professional achievements and community involvement. 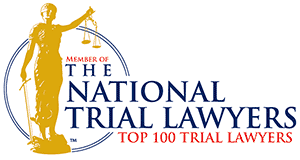 The Tennessee Trial Lawyers Association was created over 50 years ago to provide citizens, businesses, and families access to justice under the Constitutions of the United States and of the State of Tennessee. The TTLA’s mission is to protect the constitutional promise of justice for all through the right of trial by jury, preserving an independent judiciary, and ensuring access to the courts for all Tennesseans. John Griffith expressed his honor and appreciation at receiving this recent award, thanking TTLA for its consideration of his achievements.